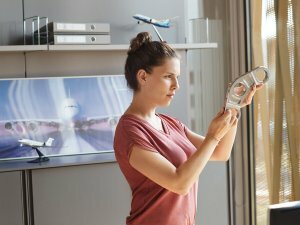 After just over a year at the company Laura Benedek, Customer Quality Engineer at voestalpine BÖHLER Aerospace GmbH und Co KG, already strongly identifies with the Group. The company also benefits, because she demonstrates this loyalty to her customers on a daily basis. It is not uncommon for voestalpine employees to have had a connection with the company before joining its ranks. A relative had worked there, or they know a current employee or people who say good things about voestalpine as an employer, and this raises interest in a career with the Group. Whatever the reason, the Group has long been one of Austria’s most important and popular employers with innumerable suppliers, and currently employs over 50,000 people, at 500 companies, in more than 50 countries, on all five continents. Laura Benedek, however, had had no contact with the Group before starting her job in Kapfenberg, Styria in April 2017. Even during her degree in industrial environmental protection, and subsequent dissertation in non-iron metallurgy at the Montanuniversität Leoben, she had no contact with the company, although that would not have been unusual. The Group spots many talents as the result of internships, research cooperation, commissioned studies, and similar. "It’s the employees that make the company what it is. Being a part of that, rather than just one of thousands, is very appealing." After working at the company for almost a year she now identifies strongly with the Group: “It’s easy to integrate quickly when you get the feeling that it’s the people who make the company what it is. Right from the start I’ve had a wide range of task to do, and been given a lot of responsibility, and I was immediately offered the opportunity for continued professional development. The company invests time and money in its employees, so that you have the chance to be involved and supported. I find it very appealing to be a part of this, and not just one amongst thousands.” That makes it all the easier for Laura Benedek to carry out her duties, namely representing the company to the outside world on a daily basis. Sixty percent of her working day consists of contact with customers because when it comes to quality, she is the first point of contact in her company for more than 110 aerospace customers in North and South America. "I represent the company to the outside world on a daily basis." “Our aerospace customers are innovative and always demanding. Each has their own set of strict provisions and specifications. My task therefore includes examining and implementing these customer demands within the company, coordinating across various departments during complaints management processes, and supporting customers during an audit.” Communications in the opposite direction also go through Benedek: “The value of your own work naturally increases when you are managing the major names in the aerospace industry. The exciting thing about the job is that every day brings something new, and you get to see what’s going on in all areas of the company. As a result of the sophisticated and innovative demands, I can even actively contribute to developing areas of the business.” And that’s important to Laura Benedek.